2015 was a challenge, with my Mom passing away unexpectedly in July and juggling the crazy work schedule alonge with trying to find a sense of balance in my life. I am very fortunate to have a large family and a very supportive husband! I did manage to squeeze in some sewing and have found a new passion in vintage sewing machines. Maybe it is because of my Mom's passing and the stories she used to tell me about her and my grandmother sewing on her 1924 Singer 66 Red Eye treadle machine. Tonight I am cleaning my sewing area and my sewing machines! Starting the new year off clean, organized, and ready to go! 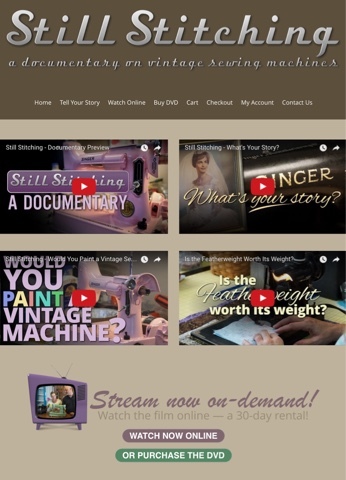 While I am cleaning, I am watching a cool video on vintage sewing machines called 'Still Stitching'. If you are interested in vintage sewing machines, I highly recommend it. I rented it for Vimeo, but just ordered the hard copy tonight. Check it out here at Still Stitching. Till next time - wishing everyone a happy and healthy new year! !